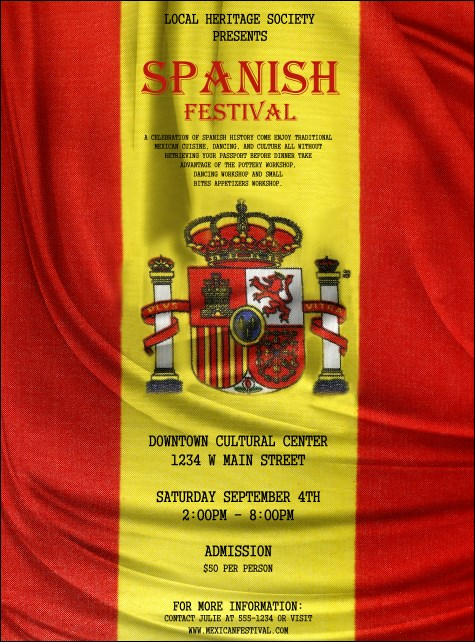 Regal and colorful, the Spanish Flag Flyer announces your cultural celebration with panache! Accented by the nation’s coat of arms and laid out atop bold red and gold, black typeface proclaims your event’s information. Pair with invitations, postcards, and posters from this design’s matching event kit. Size approximates: 8.49" by 11.46"
Fill 19 text fields with your celebration’s info. Create cohesive visual branding for your event with TicketPrinting.com.